Home » Greenroom » Occupational Health & Safety – Is Your Workplace Up To Scratch? Occupational Health & Safety – Is Your Workplace Up To Scratch? There was a time when First Aid Kits were little more than an afterthought for businesses, and comprised little more than a packet of Band Aid plasters and a bottle of iodine. But times have changed, and as a key part of ensuring health and safety in the workplace, these kits are not just expected but required by Occupational Health and Safety (OHS) legislation. Employers must provide a safe working environment for their employees, with Model Work Health and Safety (WHS) legislation, standardizing the legislation Australia-wide for the first time. The penalties now facing businesses that fail to comply with the new legislation are quite severe, so the importance of getting everything in order is arguably greater than ever. Having a First Aid kit is a key part of achieving compliance. Access to these life-saving kits must be easy, with their contents properly managed and adequately stocked at all times. But mobile external defibrillators and eyewash stations are also required. Provide First Aid facilities that are adequate for the immediate treatment of injuries that arise at the place of work. Ensure First Aid facilities include a First Aid Kit appropriate for the number of employees on each site and work environment. Ensure First Aid Kits are maintained in proper condition and the contents are replenished as necessary. Ensure First Aid Kits are regularly checked to ensure the contents are as listed and have not deteriorated or expired. Ensure First Aid Kits have a white cross on a green background with the words ‘First Aid’ prominently displayed on the outside. Ensure First Aid Kits are located at points convenient to the work force and where there is a risk of injury occurring. Provide at least one First Aid Kit on each floor of a multi-level workplace. Provide each work vehicle with a vehicle First Aid Kit. First Aid Kits must contain all items that can adequately treat common injuries for your particular industry sector. For this reason, you should carry out a Risk Assessment to ascertain which contents you need – for example, more burn gel if burns are most likely. However, while the kit itself is a key component, it is now also necessary to provide the right facilities, and ensure they are capable of coping with whatever demands might be placed on First Aiders in the event of a major accident – however unlikely that may seem to be. But there is now a stronger onus on the business officer – or person conducting a business or undertaking (PCBU) – to ensure the workplace has adequate First Aid facilities, equipment and trained personnel. This means they must accurately assess the requirements for their workplace, taking into account a number of aspects, such as the nature of the business, the typical the hazards there, and the number of staff working at any one time. When it comes to providing First Aid after an accident, it is now essential that every workplace has a properly trained First Aider on site at all times. First Aiders have to report directly to the PCBU, but their role is arguably the most important. Having enough First Aiders to deal with the staff numbers is also a key component to complying with the new legislation. The number on duty at any one time depends on the type of work too. For example, in low risk workplaces (office), one First Aider is required for every 50 workers; while in high risk workplaces (manufacturing complex), one First Aider is needed for every 25 workers. Staff can only be considered First Aiders if they hold nationally recognised ‘Statements of Attainment’ after completing an endorsed First Aid unit of competency. But the type of training is significant too. Apply First Aid – trains staff to recognise and respond to common life-threatening injuries or illnesses, including CPR, and to manage the casualty and incident until the arrival of medical or other assistance. In low risk workplaces, First Aiders need only know how to perform CPR and treat minor illnesses and injuries. Apply Advanced First Aid – trains staff in additional competencies required to apply advanced first aid procedures. Suitable for some high risk workplaces. Manage First Aid in the Workplace (Occupational First Aid) – trains staff to apply advanced first aid procedures and to manage a first aid room. Provide First Aid in Remote Situations – trains staff to administer first aid in a remote and/or isolated situation, including preparing for aero-medical evacuation. Suitable for high risk workplaces where emergency services are a distance away. First Aiders are expected to undertake CPR refresher courses annually, and to renew their First Aid qualifications every 3 years. First Aiders may also need to be trained to respond to specific situations at their workplace – for example, where workers may have severe allergies to commonly used substances. If you’re wondering just how important complying with the OHS legislation is, then consider the fact that relevant local authorities have powers to police employers within their jurisdiction, and a variety of ways to punish those businesses guilty of non-compliance. Inspectors can effectively call in on a business premises at any time and assess that workplace. So there is every probability that any short-comings that may exist will be quickly revealed. It is, therefore, unwise for any company to take a lax view of the new measures. In short, the inspectors can be good, bad or ugly! As mentioned above, OHS inspectors have the power to issue 3 types of notice, depending on the specific details of each case. These are designed to give companies time to set things right, but if a company does not satisfy the requirements after that time, then they face some serious consequences. Far bigger penalties apply to those officers, PCBUs and businesses that fail to live up to their Duty of Care obligations. Breaches of the Duty of Care are considered a criminal offence. By supporting you to keep your compliance, you can focus on your main business plans. At Alsco, we’re committed to helping safe environmental work practices and products that help make your workplace healthier, safer and greener. Our Eyewash Stations help quickly washout debris and liquid hazards, potentially saving the eyes from severe damage. We know that you aim for safer workplace, get started today! Talk to a Professional! Our representatives are waiting for your call. 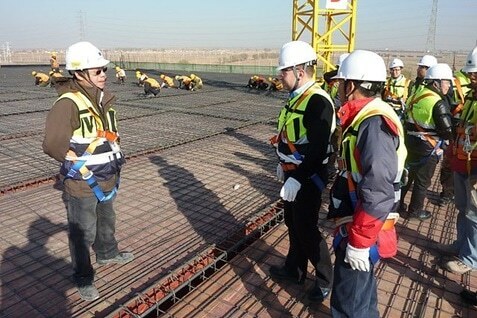 Image Courtesy:”Safety instructions at a construction site in China” by RudolfSimon – Own work. Licensed under CC BY-SA 3.0 via Commons.